Ireland’s U2 is the most important and influential band of the post-punk era, joining ringing guitar rock, punkish independence, Celtic spirituality, innovative production techniques and electronic experimentalism all held together by singer/lyricist Bono’s transcendent vision and charisma. U2 Bono (Paul Hewson), guitarist the Edge (Dave Evans), bassist Adam Clayton and drummer Larry Mullen formed in Dublin in 1976 as a Beatles and Stones cover band while the players were all still in high school. In 1980 they were signed to Island Records and released their spectacular first album, “Boy,” produced by Steve Lillywhite. 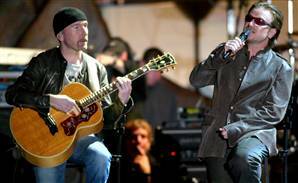 Mike Hutchings / Reuters file U2, with guitarist the Edge and lead singer Bono, is now a mature, confident, still amazing band that knows it doesn’t have all the answers, but isn’t afraid to keep asking the right questions. The band’s sparkling, radiant sound jumped from the grooves from the first note of “I Will Follow” and rode Mullen’s massive drums and the Edge’s angular, careening guitar into history. Neither “Boy” nor its follow-up “October” (with the glorious “Gloria”) tore up the charts at the time (though both are now platinum), but “War” — passionate, martial “Sunday Bloody Sunday,” melodic wailing “New Year’s Day,” and the fierce, new wavy love song “Two Hearts Beat As One”—turned U2 into a worldwide phenomenon in 1983.